WOW- Offered for sale is a high quality Overland by Ajin BRASS 2-Rail S Gauge F-7A DIESEL LOCOMOTIVE with an excellent scale detail level. Comes in the original foam lined box, made in Korea. Brass S Gauge is somewhat rare as it is seldom seen, although commercially produced. Surely the production numbers are much lower than those made in HO or O Gauge. When Powered up with 12 volts DC current, the Mashima motor tested good and the wheels turned. The universal couplers on the drive shaft may slip, should be secured and gears oiled for better operation. See pictures of the drive train. This fine Diesel Loco features an excellent scale detail level showing topside fans and cages, horn and horn cluster, side vents with spares, rungs, grips and more. There are several packs of detail or finishing parts that were never installed. Overall, should rate in excellent shape, but for minor dusting and no couplers were installed. I do not believe that this engine was operated, perhaps test run only, as the ballast weight was no installed when received and there are several packs of uninstalled detail parts. Comes in the original foam lined box with label and history sheet. Please see the many pictures provided for more details. We provide the best description we can, but we're not experts in many items offered for sale. Please see all pics, what you see is what you get (excluding display props, the table and walls, boxes and manuals only if stated and pictured). Abusive Buyers will be block listed from future sales. MY GOAL IS YOUR HAPPINESS. 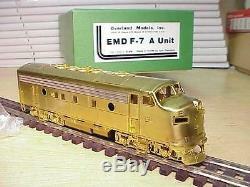 The item "Overland Ajin BRASS Korea S Gauge EMD F-7A DIESEL LOCO Runs Orig Box VG+Deal" is in sale since Sunday, July 31, 2016. This item is in the category "Toys & Hobbies\Model Railroads & Trains\S Scale\Locomotives". The seller is "llove" and is located in Reisterstown, Maryland.